Cristina Peixoto, President/CEO of Spaulding for Children at radio station in Brazil. Spaulding for Children has long been a national resource for professionals seeking the latest information and programs to help and support families and the interests of children. 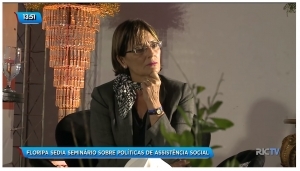 Last month, Spaulding received recognition on the global stage when CEO Cristina Peixoto spoke at the International Seminar on Social Assistance and Human Rights Policy, held Oct. 22-25 in Florianópolis, Brazil. Ms. Peixoto discussed how foster and adoptive families in Michigan and the U.S. are meeting the unique challenges of raising teen-age children. In a panel discussion, she presented information about the impact of traumatic experiences on children and their development. She also shared with those at the conference the ways Spaulding advocates for every child in need of a permanent home. The seminar was organized by the Instituto Santos Brasil to share information and discuss how five nations are working to serve their publics through advances in services, programs and policies. Participants included representatives from Argentina, France, the United Kingdom, the United States and the host country, Brazil. Seminar participants from Brazil described how the nation today helps children in state care through small-group homes, where six to eight children live together under the care of adult professionals — and where parents were encouraged to drop in throughout day and be an active part of their child’s life.